This could be the pavilion of your dreams with many natural elements in it. You would not often see a pavilion near a house because obviously, it requires another lot area to occupy which is not always available in most homes. But some residences manage to put their own pavilion. 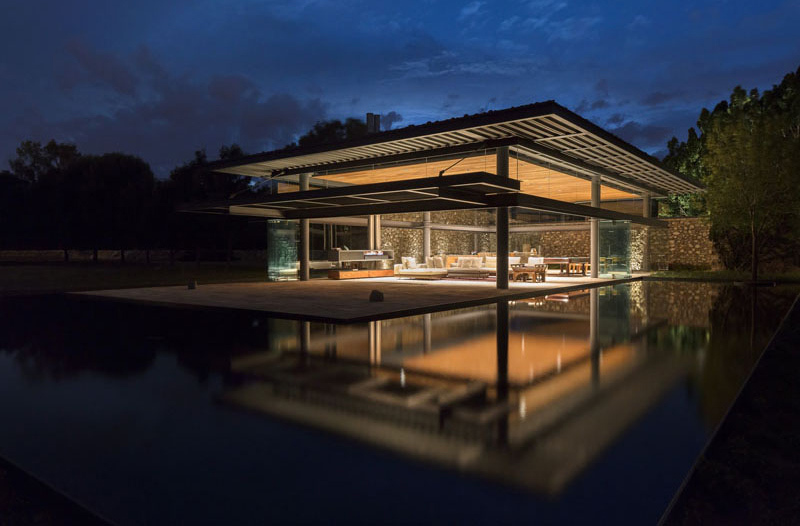 If you are not that familiar with it, a pavilion is a subsidiary building which is located either as an attachment to the building or a separate structure. Its main function is for pleasure and entertainment of the family or the guests. So detached or attached, the pavilion is indeed a nice place to read a book, have some coffee, drink wine and just have a great time with the people you love. 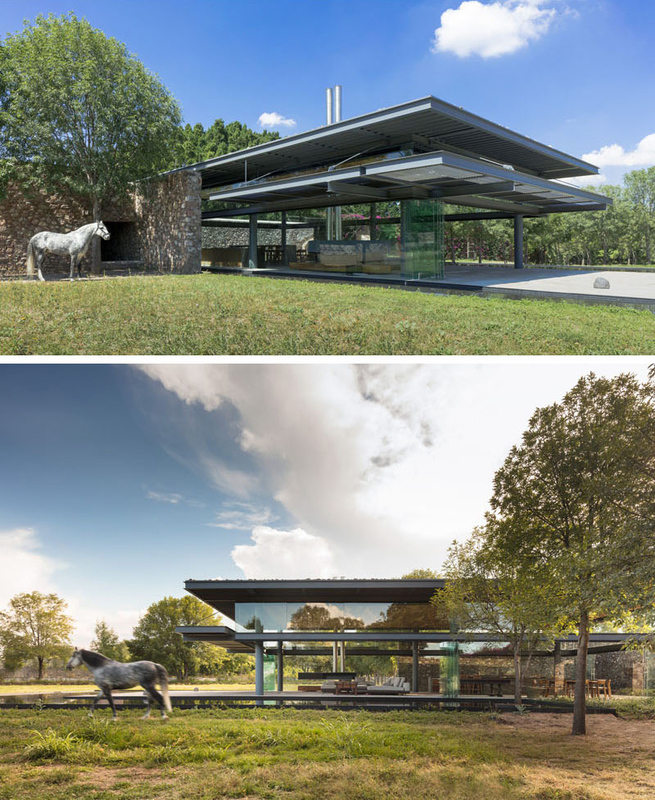 Today, we will feature a project from Grupoarquitectura. 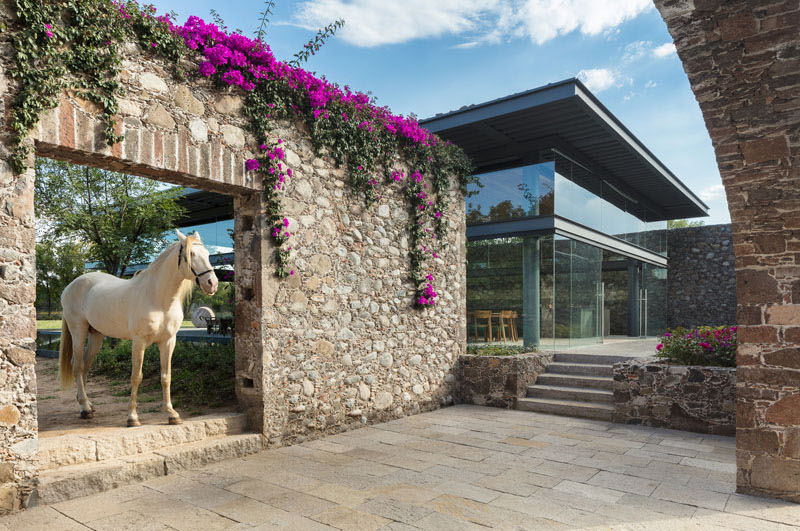 The firm designed the Hacienda El Barreno Visitors Pavilion that sits among the old stone walls of a hacienda (estate) in San Juan del Rio, Mexico. You will see in the images below that the residential area is indeed blessed with land and nature. It is nature’s beauty that makes it look very stunning plus its unique modern design. 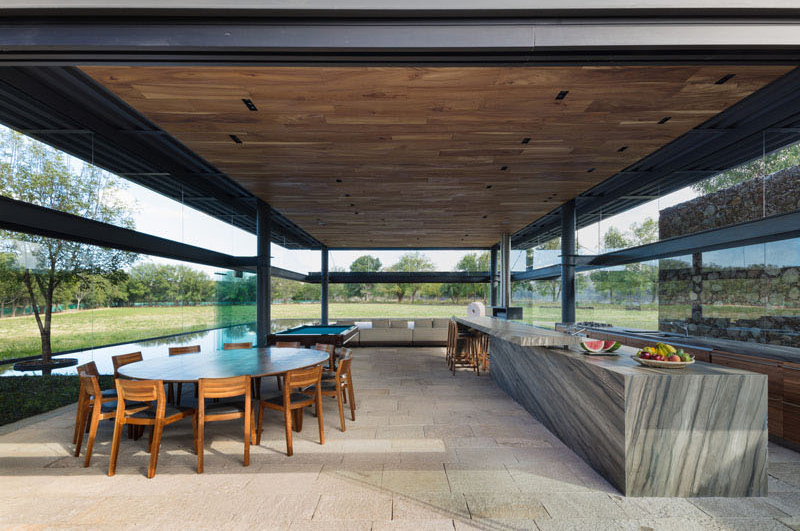 The pavilion has huge glass door and panels around it which makes it transparent. 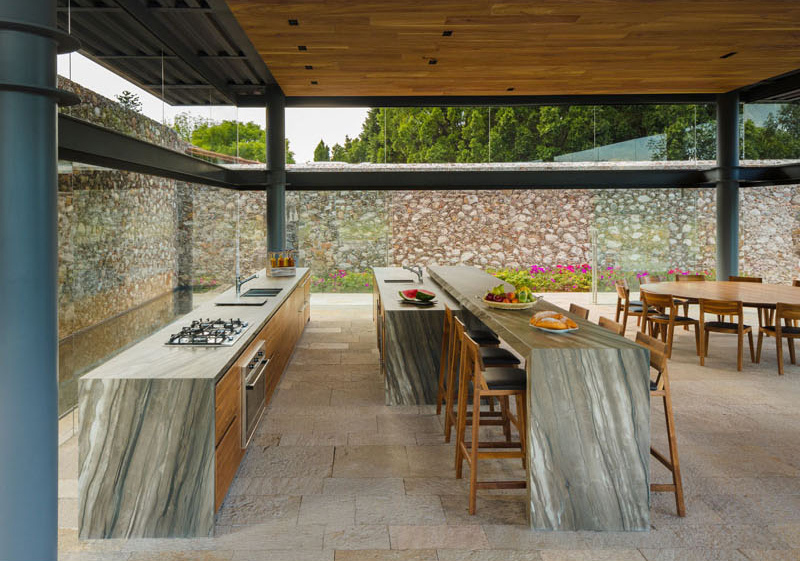 It also features stone walls that bring a natural feel to the area. Aside from that, it is almost surrounded by water! Come take a look at the pavilion through the images below. Unique feature: A modern pavilion that has many impressive features including its usage of glass and its stone walls. This 600sq.m. home sits on an 800sq.m. lot which means that it really has enough space for outdoor. The house is apparently spacious with white exterior and white fence. 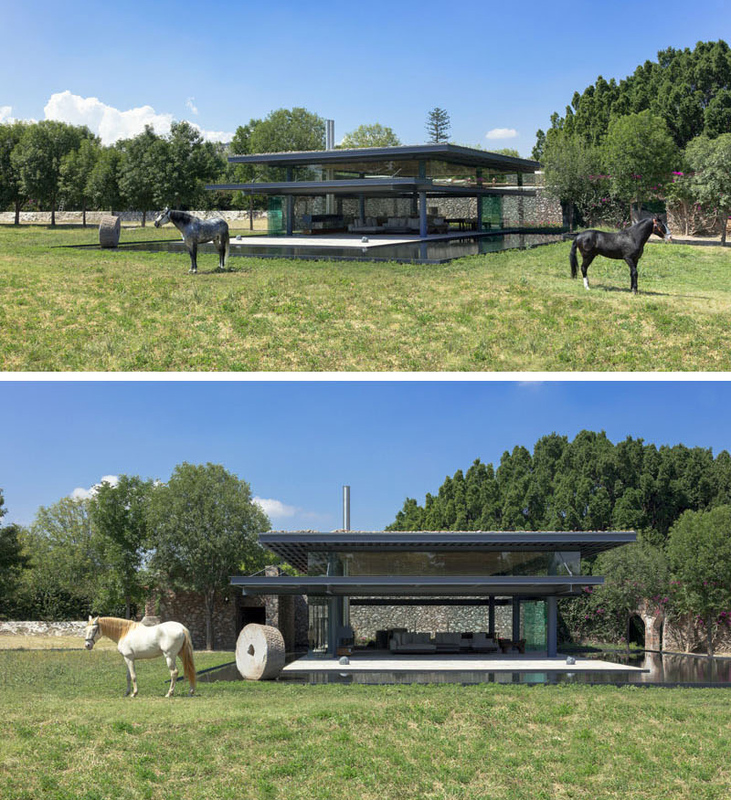 The design is modern with a minimalist approach for the home’s architecture. The pavilion, used by visiting guests and for events, features a large water feature that reflects the architecture of the structure. Water almost surrounds the pavilion at the same time which makes it appear more interesting. 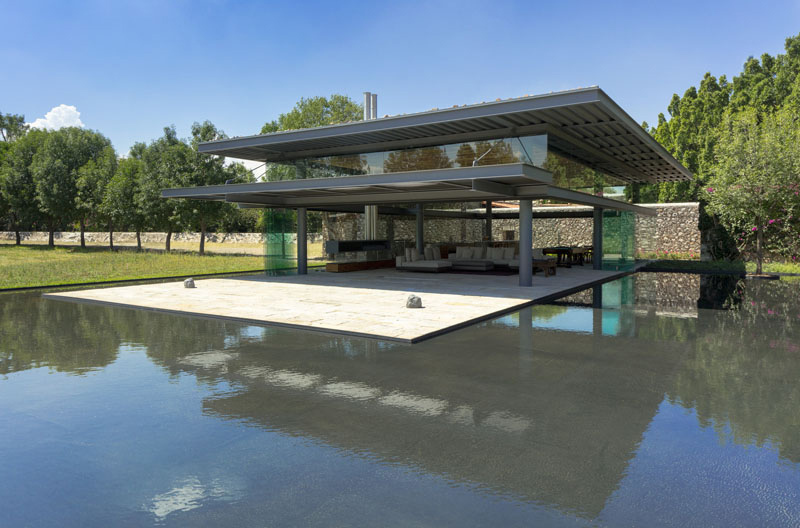 The materials of this project are metal, glass, stone and wood. When used together, they result in a beautiful structure. The mix of materials is ideal which also gives it a natural feel. During the night, the pavilion’s light makes it look more beautiful and attractive. In fact, it looks like a lighted sculpture in the middle of the darkness. 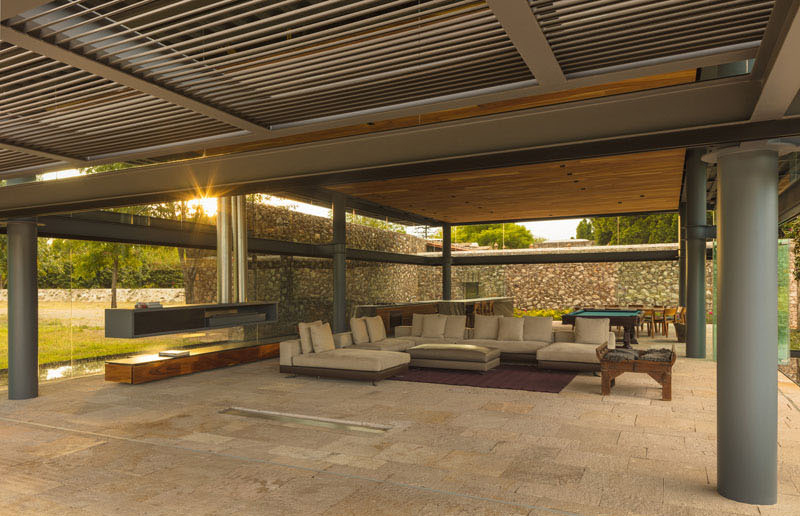 At the entrance to the pavilion, guests are greeted by stone walls and large sliding glass doors which made the space appear inviting. 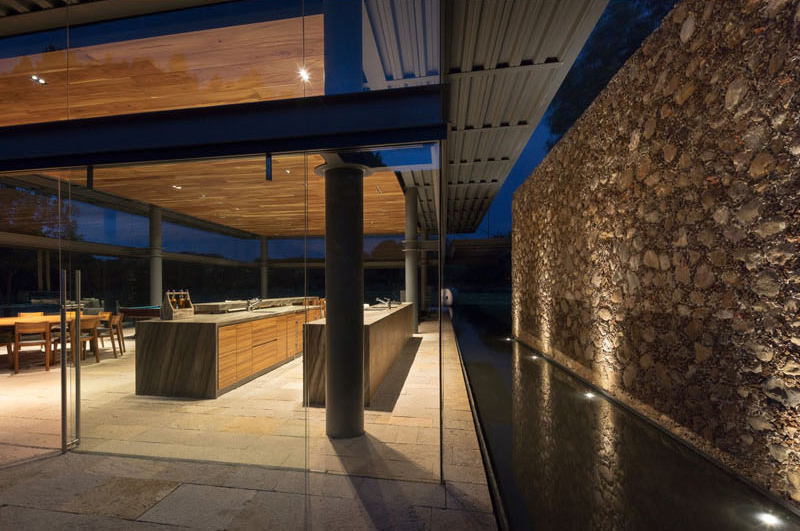 It also has a water feature around it between the stone walls and the glass walls. That horse is indeed a beauty! But of course, that isn’t the point of the photo. It actually shows us the stone wall which looks very dramatic and romantic because of the vines and purple flowers on it. Seems like a really great spot for photography! A large living room with a fireplace shares the space. The fireplace is also an added decor to the area it. This part of the pavilion can be reached before opening up to a patio with uninterrupted views of the field. Apparently, the space has an open floor plan and everything in it is just there. You can even see here a pool table that breaks the living space and the kitchen-dining area. Notice also that the modern space has a subtle industrial touch. You can see here the kitchen and dining area. The eating space features a round wooden dining table that seems to break the monotonous usage of straight lines from the architecture to the furniture. It also adds more appeal to the interior. Once inside, one can see a kitchen to the right with an oversized island covered in stone. For sure you will agree with me that this is such a nice kitchen. It would be awesome to prepare food here while looking at the lovely view around it. On the left of the kitchen is a round wooden dining table. I’d say that this is indeed a real beauty! Who wouldn’t love to see a space as lovely as this one? 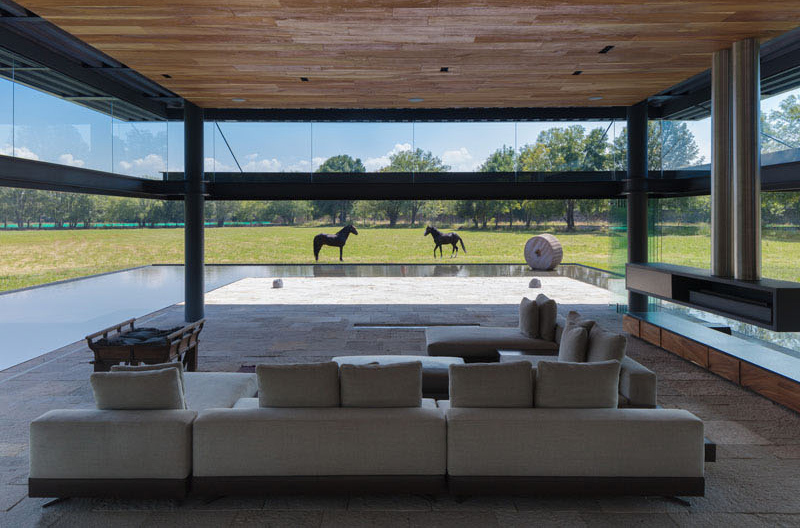 Guests will no doubt love this space which is designed byGrupoarquitectura. I know you will agree with me that the horses around the area are an added bonus. And of course, the greens around it too are a nice combination with the waters. Some homes that have really spacious lot area have pavilions but having one with a design like this would really be awesome. Another commendable thing about this pavilion is its mix of materials. Overall, it sure is a fearless design which moves away from the conventional style of pavilions.